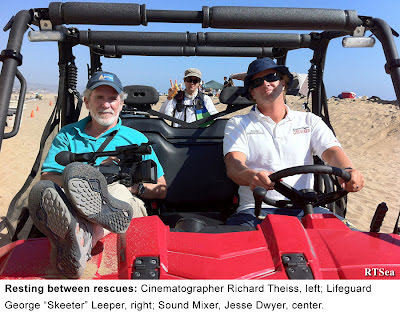 RTSea Blog: observations on oceans, sharks and nature: Filmmaker's Journal: shooting the reality series, Lifeguard! Filmmaker's Journal: shooting the reality series, Lifeguard! I have just completed principal photography for the second season of the Weather Channel's reality series, Lifeguard! The work entailed multiple small crews working up and down the Southern California coast, from Long Beach to San Diego, waiting to catch real-life rescues and incidents that make up a lifeguard's busy day. Well, sometimes busy. And sometimes not so much. If the weather was gloomy - keeping the crowds away or at least out of the water - or if the surf was not too great, then much of the lifeguard's time was spent simply watching the beachgoers, keeping an eye out for something that may or may not happen. Part of your shoot day would be spent on B-roll: various shots of the crowds, little kids playing in the sand, shots of the surf. Often times you would film things that most people would think, "Why?" That's the beauty of B-roll; it often fills the many little visual voids in the storyline and it can consist of what would seem to be shots totally unrelated to the production. But as I looked for artsy images to pass the time, I also kept one eye on the lifeguard tower. I watched for subtle signs - a couple of extra gazes through the binoculars, a brief conversation on the walkie-talkie, the unzipping of a windbreaker - and then it happens. The lifeguard bolts down the tower ramp and heads along the beach, perhaps 75 to 100 yards, then straight into the waves. I need to get that establishing wide shot of the lifeguard heading out, then chase after him or her, and eventually wade into the surf up to my knees, zooming in to try to catch all the action, all the while trying to keep the camera steady with my heart thumping away. While lifeguards in Southern California are a multi-skilled agency that can include dive teams, rock climbers, boat rescue teams, and even armed peace officers, a major part of their efforts are devoted to dealing with the consequences of rip currents. Rip currents occur when the mass of water being pushed up onto the shore by the oncoming swells needs to recede. Fluctuating changes in the sandy bottom can cause water to seek the path of least resistance and when it finds it, you have a rip current - a river heading out to sea that could extend for hundreds of yards. Strong storm waves or tidal changes (particularly from high tide to low tide) can produce rip currents. Some beaches have underwater topographies that produce predictable "permanent rips," but "flash rips" can also pop up at any time and catch unsuspecting swimmers off guard. As I stood in the surf, zoomed out and trying to hold the image as rock-steady as possible, I could feel the sand eroding underneath my feet as the surf would claw away at me. Getting knocked down, even in water whose depth is only mid-calf, is a distinct possibility, particularly for small children. But the usual rip current victim is one who was touching the bottom one moment and then, with a rising swell, loses touch with the bottom and off they go, out to sea. This is not something which I had any intention of doing with camera in hand, so I would slowly move my feet and reposition myself to more solid sand, however momentary that might be, all the while still continuing to shoot. By the end of the day, you're longing for a simple stage shoot with the camera locked off on a secure dolly or jib arm, shooting with prime lenses. The classic remedy for when a swimmer is caught in a rip current is to swim parallel to shore, thereby ultimately swimming out of the rip current. You may find yourself several hundred yards offshore but you are now at least able to swim back in. However, many people who find themselves in a rip current try to swim against the rip current or have been in the water for a while, expending energy, and they tire quickly. The lifeguards are trained to spot the swimmers who seem the least comfortable or experienced in the water. It's those people that will garner their attention and often the lifeguard will swim out to them and direct them to a safer area as a precaution, thereby preventing a rescue. On the last day, we shot a dramatic "mass rescue" where seven people were caught in rip currents all at once. It required great coordination between lifeguards from several towers and the assistance of a rescue boat, which cruises beyond the surf zone, to round up all of the victims and get them safely aboard the boat. After first making sure that everyone was all right, the boat then proceeded to back up through the surf into very shallow water (a tricky maneuver for a 25-foot boat) and the lifeguards shepherded everyone back to the safety of the beach. Throughout the shoot day, we would get interviews with the lifeguards involved in particular rescues and I was impressed with the camaraderie and support that all the lifeguards provide for each other. For some, lifeguarding is a seasonal passion but there are many who are full-time employees with decades of experience. And everyone - young or old, rookie or veteran - is covering each others' back. The Lifeguard! series makes a concerted effort to show how hard working these public servants are. No rescues are staged - a strong mandate from the executive producer - and, in the end, there's really no need to fabricate anything. The ocean attracts people from far and wide. It's seen as an aquatic playground but it is also an untamed wilderness. When it wants to, it will remind people of that in no uncertain terms. I finished the final shoot day nearly up to my waist in the surf, capturing a sunset streaming through the nearby pier. Golden sparkles danced over the wet sand as the water would recede, and when the sun dropped below the horizon (and the incoming tide was about to swallow me up with the next wave) we wrapped and called it a day. But for many of Southern California's lifeguards, it was simply the start of their week. My thanks to the various producers, sound mixers, and production assistants I worked with over the past few months. Top flight professionals who helped to make a tough job easier. Now if I can just get all the sand out of my cameras.